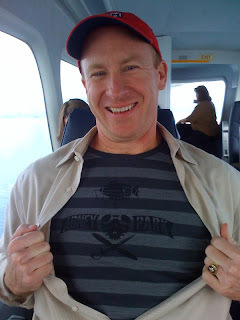 Mike wearing his Abney Park airship pirate shirt. We frisked him upon discovery. That's a mighty FINE shirt you're wearing there, Mike! He clearly has very good taste in clothing, for I have that exact same shirt. But alas, he is much cooler for taking a ride with you guys. Obviously a man of discerning musical taste. Good job, sir! Thanks guys! Had a wonderful trip and can't wait to go again soon!